We’ve been serving the local community in and around Erin since 1955. Although our core business has long been manufacturing and procuring the finest quality feed, we have always maintained a well stocked retail store that features much more. Our store is open to the public stocking, as our branding says, provisions for country living—everything from pet food, supplies and accessories to lawn and garden supplies. We carry bird and wildlife products, everything for the care and well being of horses, and pretty much most of the things you’ll need as part of your day-to-day country life. 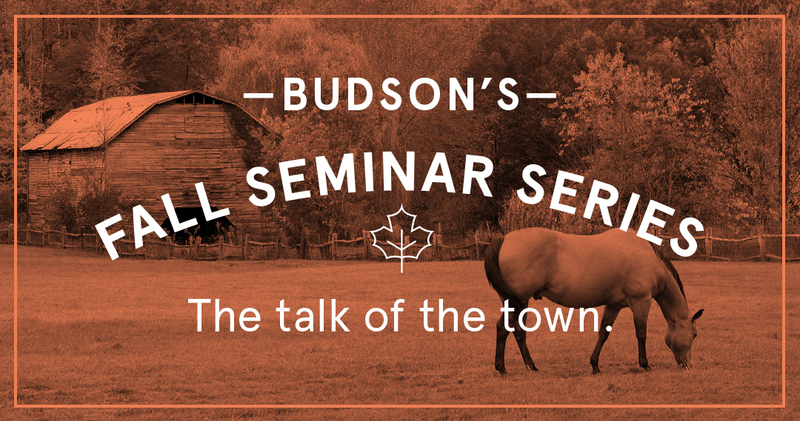 Thank you very much for your interest in the Budson’s Fall Seminar Series. Please keep in touch and we will gladly advise on the date of our next event. Carol Wetering, has a lot to do with our growing reputation. With over 25 years of dairy farming experience and over 20 years in the lawn and garden and agricultural retail environment, she is a proven, valuable resource to customers and thus an asset not only to the store but the local community as well. Come in and say hello – We’re always happy to see you. © 2019 Budson's All Rights Reserved.